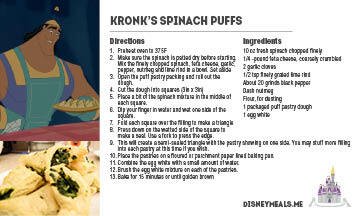 We at DisneyMeals.me make every single food dish shown in Disney movies. I am not a professional chef by any means, but I love cooking and creating my own recipes. So I set out on this endeavor, supported by my beautiful wife, to once a week, watch a Disney animated film and cook every food featured in it. We stared with Snow White and watched in chronological order. We are more than halfway done, but there is still tons more to make. Food is expensive, and we try to stay as true to each movie as possible. That means that some ingredients are pricey and/or hard to come by. With your support we will be able to make the truest-to-the-movie recipe as possible. We also hope to publish a cookbook that contains all the food shown in Disney movies. That is a huge undertaking, but with your support, we can do it! Check out the cool perks that you can get as a DisneyMeal Patreon! With your donations you can see behind the scene photos, get recipe cards (pictured below) or even try some of the recipes! We won't be able to thank you enough in supporting us. We hope that you will enjoy this journey as much as we are! Get a shout-out on each of the blog posts! Shout-out on each of the blog posts + Shoutouts on videos AND get select recipes early! Previous rewards + A pack of DisneyMeals branded recipe cards for each recipe that was on the blog for that month! Collect them all! All the previous rewards + the mother lode of all rewards, we will send you a box each month with a Disney Meal treat inside! Previous rewards and if you're ever in Chicago, we'll make you an amazing dinner. With $100/mo we'll be able to buy the best/truest ingredients and we'll up the production value of our posts!